ACTIONETIX | Mental Preparation – Are You Ready? The Nationals are Coming – Are You Mentally Ready? A wise man once told me that in motocross, it’s not the speed that hurts… it’s the sudden stop! And for all of you who have experienced your own “sudden stop”, you know just what kind of mental focus it takes to put that all behind you and perform at your best when you hit the track the next time. You have to overcome the natural desire to look back at what went wrong, at the same time as getting back on the saddle to clear the double that’s in front of you. This type of mental recovery is just one aspect of the incredible mental challenges that racing dirt bikes presents us with. Normally, in this column, I discuss physiological strategies to improve performance, but with Loretta’s and the Walton GNC fast approaching, I felt it was time to help with mental preparation as well. While in the pursuit of higher learning at University, I had a great professor who was really a pioneer in the world of sports psychology. In class, Dr. Terry Orlick talked about things that could really take your performance to the next level, but at a young age, we probably didn’t give the lectures the attention they deserved – we lacked focus. He discussed things like commitment, visualization, distraction control, positive imagery, and other things that when practiced, lead to exactly what he expected from us in class – focus. As time passed after my university years, I could slowly see exactly what Dr. Orlick was talking about. The strategies he preached to help athletes become their best, continued to get clearer and clearer. How you eliminate distraction, drive routine and create positive images, really dictates your focus on the task. Competing in Motocross has to be one of the most mentally demanding sports on the planet and the ultimate test on focus. It’s not like tennis in the respect that if you loose your focus on an MX track – the end result can be catastrophic. Loose your focus in tenis and all of a sudden it’s 30:love. You have to have a mental plan and strategy to maximize your results and ride “in the zone” at the peak of your potential. 4) Organize your routine: Repetition and routine can establish a positive performance pattern. Training consistently, eating a stable diet, dedicating specific times to riding and performing a regular routine at the gate will create a familiarity and calmness… which translates to positive performance. 3) Control external distractions: This tip is directed at not only the day of the race, but the weeks and months leading up to important races. The world’s best athletes are exceptional at filtering out, or avoiding distracting situations. As a race like Walton approaches, you may have to sacrifice some of the things you would normally partake in like parties that disrupt your sleep patterns and throw your routine off track. You need to be focused on the end goal. 2) Practice positive visualization: This is a technique that you’ll have to practice regularly. Close your eyes and try to visualize yourself on the starting gate… hold that image. Open your eyes, and close them again. Now visualize yourself again at the gate but now watch the gate drop. Focus on how your bike feels a you time the start perfectly and rocket out smoothly to the first corner. Repeat this process and add another section of the track each time you visualize your performance. The repetition of this positive visualization becomes very clear, and will eventually transfer to the actual physical performance of a race. 1) Focus intently: Even the weekend warrior will say that they are completely focused at the race… this is after a few beers the night before, no warm-up before heading to the gate, not checking if all the bike controls are working properly and of course not drinking at least 8 liters of water each day. This focus comes from preparation and routine – it comes from filtering out distraction and negative thoughts. You have to be organized with a plan to maximize focus because if you’re not, this sport can be unforgiving. 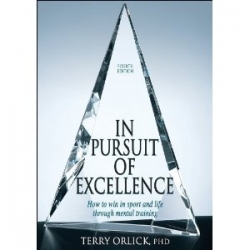 Practice these techniques and I would also suggest picking up a copy of Dr. Orlick’s book In Pursuit of Excellence for a much deeper look at how to mentally train for maximum performance and enjoyment. As always if you have any feedback on this or other articles I have written, send me a note at info@action-brands.com. And make sure you go to ACTIONETIX.com for more performance articles to help take you performance to a completely different level. Ride fast, ride safe.